When it comes to Granite installation Phoenix homeowners know Granite Dude offers the best selection, lowest prices, and most experienced installation of granite countertops. In order to better understand how the process works, we have put together a simple step-by-step guide for new customers. The next step is to determine all of the specific details pertaining to your project. At this time edge detail, back splash heights, and sink applications will be selected. Once we have gathered all of these details from you, paired with your final color selection, we will provide an accurate and precise quote for your project. Upon moving forward we will need a signed contract and deposit for the job. Within a few days of receiving a deposit and signed contract, one of our experts will be out to your home to take a template and final measurements. To ensure a speedy template, please have your counter tops cleared off for the template. 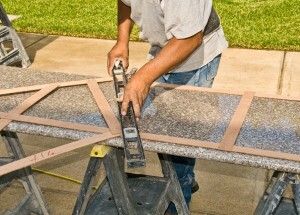 Within 14 days of the template, our custom granite installation experts will return to your home to install your new granite counter tops. At this point all sinks are installed, and any necessary faucet holes are drilled. We will also remove your existing counter tops when applicable, easing your new transition. Within a few hours, we will have your counter tops installed and ready to go. The best part is, your final payment is not due until the project is complete!